Millions of years ago the house dust mite and the sheep scab mite lived together as parasites of warm-blooded animals. 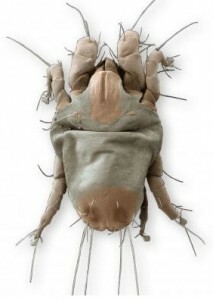 At some stage in time the house dust mite became a scavenger less dependent upon the health of its host for survival. By comparing the lives of the two mites living today echoes of past parasitic behaviour become apparent. The house dust mite is not as harmless as portrayed. In ancient tines the parasitic house dust mite and the sheep scab mite were not burrowing skin mites like scabies, but lived on the surface feeding off their warm-blooded hosts. At some stage the house dust mite changed to become a scavenger eating organic or decaying debris that littered nest sites. Even though this evolutionary separation happened millions of years ago, the house dust mite has retained some of its parasitic features. By comparing the two ancient relatives today the shared features become apparent in their life styles and by the production of aggressive digestive enzymes designed to make food for the mites. The adult sheep scab mite lives in colonies in high humid conditions feeding on the skin of sheep, or cattle. In perfect conditions egg to adult takes approximately 11 to 19 days, with adults living for up to 40 days. Females can produce 50 to 100 eggs. Unless disturbed the mite will spend its entire life feeding on one animal. Herd infestation happens through direct contact of animals or by transferring from infested wool or hair left on fence posts or in farm chutes or trucks. If dislodged from its colony a sheep scab mite can remain active for about 15 days before becoming dormant prior to death. Most outbreaks of herd infestation happen in the autumn, or if animals are kept indoors in winter. Once it was thought that the mite pierced the skin of its host with its mouth in order to feed, but that thinking has now changed. 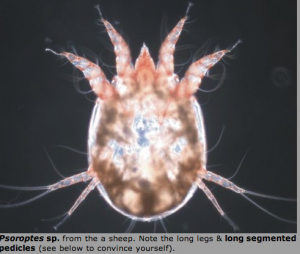 New research has found that enzymes in the mite's dropping cause an intense irritation on the animal's skin resulting in inflammation, scabs, discolouration of thickened skin, wounds open to bacteria and/or loss of wool. The sheep scab mite feeds on the liquid produced by the reaction. Its presence at the site causes a progressive and intense allergic dermatitis. The mite's dominant allergen responsible for the animal's distress is a cysteine protease enzyme named Pso o1. It is an aggressive digestive enzyme created in the mite's mid-gut and then transferred into its dropping. Pso o1 is very similar in action to the major house dust mite allergen Der p1 known to damage or kill defence cells in humans. Sheep scab mite colonies can be found living under scabs on the animal. Animals affected can become sickly and die if not treated. Treatment consists of quarantine, use of mite-killing sprays, or anti-parasite injections. Avoidance of sheep scab mite infestation in sheep or cattle is essential for the health of animal herds. For cattle in the USA infestation by this mite is a reportable disease. The house dust mite shares many of its characteristics with the sheep scab mite. It lives in colonies, with a completed life expectancy of approximately 3 months. Like the sheep scab mite, dispersal of its colony is the result of disturbance or overcrowding. Both mites produce digestive enzymes in order to feed. Many are transferred into their droppings and known to cause allergic disease in warm-blooded animals. The house dust mite and sheep scab mite need warm humid conditions to thrive and can live in hostile (less humid) conditions for short periods of time before death. Colony populations in both species increase in the autumn dying away in late spring and summer. Here's the difference. The house dust mite has evolved to become a scavenger, a clever move by the mite, because it no longer relies upon the health of a host for food. As its name suggests, the house dust mite lives indoors in warm, damp, dark and still places like beds. As a scavenger the mite feeds on organic debris found in dust, eating decaying old skin scales covered in yeasts, bacteria, and fungi. It will also eat wheat and corn flour, dead mites, plant fibres, pollen, dog food etc. In order to digest this varied diet the mite has developed an array of enzymes to tackle the job. Many of them are known allergens causing disease in humans, and dogs. One of the most common is the cystiene protease digestive enzyme Der p1. Its action has been described as similar to a meat tenderiser used in the food industry. Der p1 acts by dissolving the 'glue' that binds epithelial cells together, most notably in the lungs. The allergen shares 58% of its identity with the parasitic sheep scab mite allergen Pso o1, and is said to be a reflection of the close relationship in ancient times when the house dust mite was a parasite of warm-blooded animals. It is interesting to note that storage mites, living on grains, do not have this allergen; there appears to be no need. House dust mites are a major cause of asthma and allergic disease worldwide. Avoidance of the mite is the first step in treating house dust mite related allergy. Drugs are prescribed to control symptoms and immunotherapy to induce tolerance. Vaccines are promising remedies. Control of infestation is through various methods including anti-mite sprays or poison, hot washing of bed linen etc, freezing, exclusion by using mite-proof material on mattresses and soft furnishings, tumble drying, and reducing moisture to below 50% RH are all clinically proven to work against house dust mite infestation.